This show at the Caza Sikes gallery in Oakley consists of eight large works meant to be viewed in a specific order, as the central subject in each, a monk, makes a journey of self-discovery. Tres Taylor, a biochemist and now a self-taught artist living in Alabama, prepared a statement for his show about the ancient Indian chakra system, in which understanding connections between the mind and body can lessen suffering and lead to states of spiritual well-being. His monk’s journey is related to this system. Another statement, handwritten by Taylor on the gallery wall, mentions the monk’s inclination to sneak out of his monastery at night to experience the beauty of the world and spread happiness among people. Taylor works with two contrasting traditions of the monk in art: the elongated body and narrow face of the ascetic and the jolly friar enjoying life’s pleasures. Clearly, this show has a complex framework. Paintings in a series can illuminate each other. In Taylor’s series, the common elements include the monk, a man and a woman in stylized evening clothes carrying facemasks, the houses of a city, flowers, and birds. These elements change only superficially from painting to painting. As a result, they do not play off each other in any very interesting ways. They do, however, contribute to the narrative running through the paintings, the story of the monk’s journey to enlightenment. For example, in the seventh painting, “Pulling off all the Old Masks Just to See the Flowers Bloom Again,” the couple stand next to a box of discarded masks. Once I had walked through Tres Taylor’s series, carefully noting the stage of enlightenment depicted in each painting, I felt free to wander the gallery. This is when the show came alive for me. Taken on their own terms, Taylor’s paintings demonstrate astonishing use of color and, at times, mesmerizing compositions. In “Ikimasho,” the beginning of the series, the monk is alone on the canvas. He is dressed in brilliant gold, set off by the deep blue of the trim and his hat and the red and green background. The composition is a series of repeated geometric shapes. The angular face and body of the monk and the parallel lines formed by his staff and the basket on his back create one pattern. The circular design in the monk’s robe, repeated in the round flowers, the bird, and the curved line where the earth meets the sky, create another. In this work, Taylor’s naïve style of representation is wonderfully offset by the drama of his color scheme and the sophistication of his composition. Tres Taylor considers himself a folk artist. Like the best folk artists, he achieves beautiful results using simple materials. Taylor works on tarpaper and uses house paint. Each image is painted separately, cut out, and applied to a board. Lines carved into the tarpaper delineate the separate elements, making the paintings resemble mosaics. The finished work is sealed with a heavy varnish. 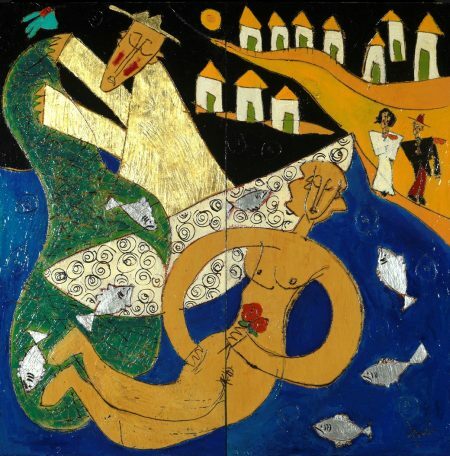 One of the stronger paintings in the show, “Release,” shows the monk in a boat releasing fish from a net into a sea where a naked water maiden swims. In its swirling, sensuous composition, the work resembles a Chagall as much as folk art. There is a limited but vibrantly contrasting color palette. The central image is pulsing with movement but it is also balanced, contained within a circle, giving the work a sense of harmony. 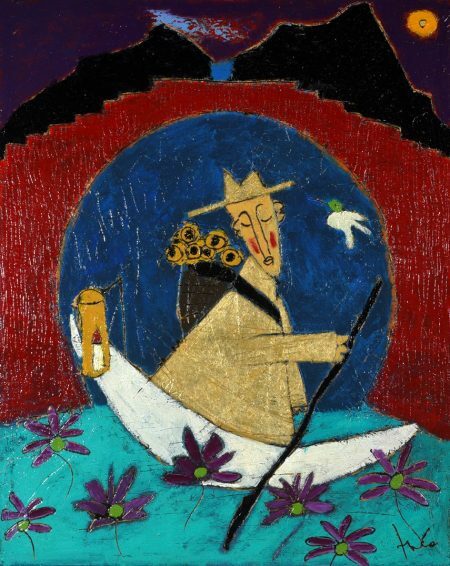 The echoes of Chagall in Taylor’s work come from his use of stylized figures and dream-like visions. Since he works only in pure blocks of color, his technique allows for no shading or shadows. 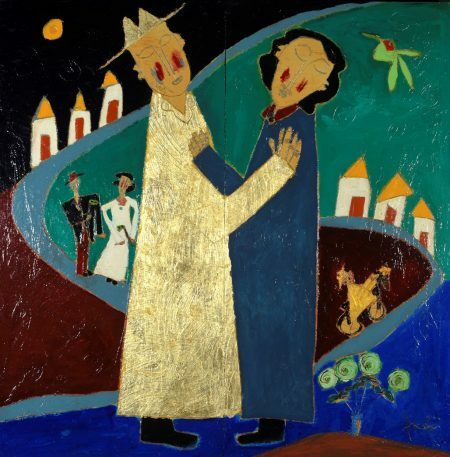 In the aptly titled “Compassion,” the monk and a woman embrace. This is the only painting in which the monk’s angular face is rounded, matching the softer face of the woman. The deep slate blue of the woman’s dress subdues the bright gold of the monk’s robe. She is consoling the monk. The landscape that curves through the painting divides it into panes of color. 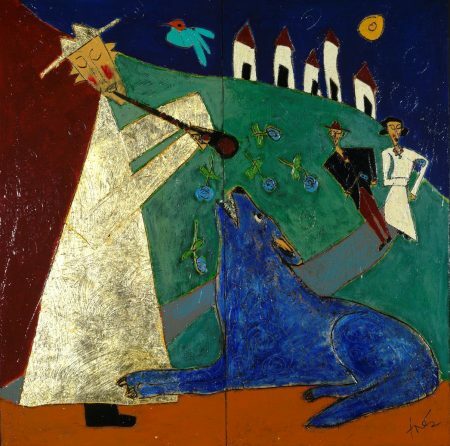 “The Song of Truth” is another painting in which the monk shares the center of the canvas with another figure, in this case a large, slightly menacing blue dog. The monk tames the dog with music and flowers. The triangle formed by the bodies of the monk and dog emphasizes the relationship between the two central images, but the strongest appeal of the painting derives from Taylor’s brilliant coloration. The urban setting through which the monk wanders and the man and woman he encounters do not appear in “Crossing Over,” the final painting in the series. As in the first painting, “Ikimasho,” the monk is alone at the center of the painting, this time in a boat. A round bridge surrounds the angular lines of his face and body. The boat, a half-moon shape at the base of the bridge, completes the circle of life through which the monk travels. The flowers in the monk’s basket, the moon, and the flowers in the water continue the pattern of circular shapes. Every element in the composition draws attention to the monk’s face. The angle of his head and his closed eyes convey repose. Taylor’s naïve style—elemental shapes, lack of perspective and strong primary colors—gives this painting the power we sense in all genuine expressions of the spiritual. “Crossing Over” may be the culmination of a series, but it can stand alone as a fully realized work of art. Tres Taylor is an artist with a distinctive style and technique. His use of color is striking and his compositions have genuine power. That Taylor works with a limited subject matter is apparent when a number of his works are seen together. The angular, elongated, whimsical monk appears in most of his paintings. This may be the condition under which Tres Taylor can create his art. Whatever the case, we can be grateful this biochemist changed careers. Caza Sikes is a relatively new and attractive gallery featuring a wide range of art, with a special emphasis on sophisticated folk art and crafts. The Tres Taylor show closes on December 2, but the gallery exhibits his work on a regular basis, so a number of his paintings remain on view. Incredible paintings and excellent review. Moma next? ?